Jeff Lange Remembers Fantasyland Classics Special Collectors Edition DVDs, 20,000 Leagues Under The Sea or Mr. Toad's Wild Ride. Jeff Lange Remembers Fantasyland Classics Special Collectors Editions. 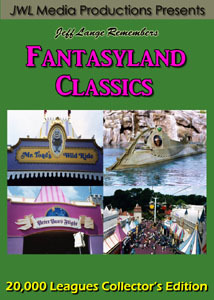 Jeff Lange Remembers Fantasyland Classics Special Collectors Editions Released Today. 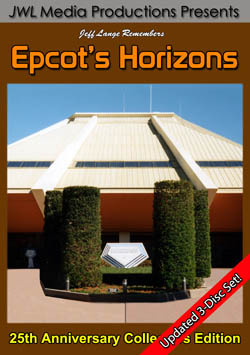 Disneyana fans already know that JeffLangeDVD’s series of theme park DVDs offer a high quality look back at memorable Disney events and attractions. But the special collector’s editions of Lange’s best selling release ‘Fantasyland Classics’ is sure to be something special. How so? Well, how many of us after we’ve made a trip to a Disney theme park have wished that we were able to take home a chunk of our favorite attraction? Now, with JeffLangeDVD, you can! 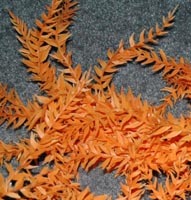 Mr. Lange, has procured Seaweed from the ‘20,000 Leagues Under the Sea ‘ lagoon and Bumpers from actual ‘Mr. 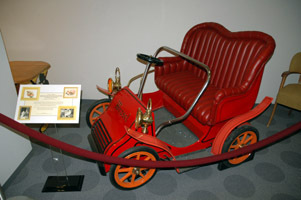 Toad’s Wild Ride‘ vehicles. The 20,000 Leagues lagoon seaweed and Mr. Toad’s Blue bumper have been cut into 100 pieces each and will be included ONLY in the 100 Collector’s Edition ‘Fantasyland Classics’ DVDs (featuring a matching Green or Blue cover) being sold now. with each DVD, making this disc something that any 20,000 leagues or Mr.Toad fan would love to own. 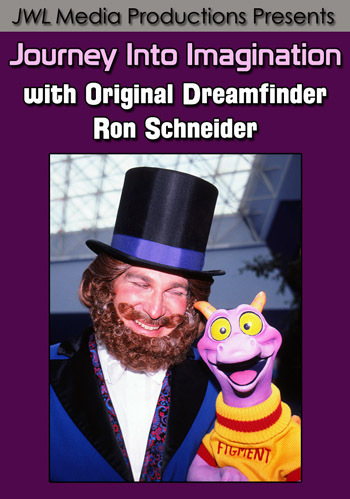 There are only 100 copies of each special Collector’s Edition of “Jeff Lange Remembers Fantasyland Classics“. 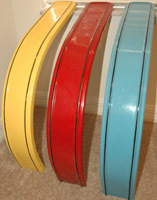 And when these discs are gone… They’re gone. So be the first and maybe the only one on your block to own a piece of the 20,000 Leagues or Mr. Toad legacy! 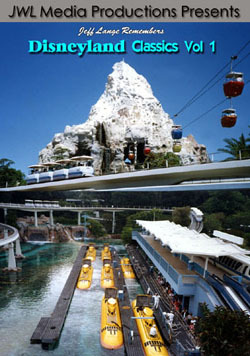 Join Jeff Lange on a trip back to Walt Disney World circa 1991 When it was still possible to take a wild ride with Mr. Toad, join Captain Nemo on a voyage aboard the Nautilus, be startled by the Wicked Witch or soar high above the Magic Kingdom aboard the Skyway. You start your journey with a photo tour of Fantasyland featuring the Skyway and Mr. Toad interiors. 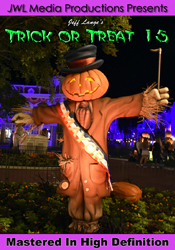 Then it’s off for a wild ride on both tracks of the classic Mr. Toad’s Wild Ride attraction. 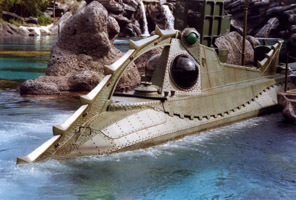 After you recover from your ride, we join Captain Nemo for a voyage that will take us 20,000 Leagues Under the Sea. You experience the anticipation before boarding the Nautilus with full coverage of the exteriors and queue before enjoying a complete ride thru. Upon surfacing you view a photo tour of the attraction featuring never before seen images of the final resting place of the subs. flight we take a photo tour of the attractions before setting sail on the Happiest Cruise That Ever Sailed… It’s a Small World. 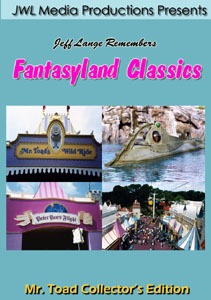 “Jeff Lange Remembers Fantasyland Classics” is a must own DVD for anyone who has never experienced these classic attractions or wants to relive a magical part of Walt Disney World history.